Watch Santa navigate his way around the world with a Santa tracker. Using Christmas Eve tracking reports creates a magical feel for young children and adults alike as they anticipate the arrival of Santa. In the 1950s, the North America Air Defense Command (NORAD), a collaboration of Canada and United States air defense, started tracking Santa Claus on Christmas Eve. Volunteers at the Santa Tracking Operations Center field phone calls, e-mails, and update the website with reports of Santa Claus making his rounds. To track Santa's progress on Christmas Eve, an internet tracking map marks where Santa sightings have been, complete with video in some cases. The map is available in 2-D or 3-D.
To get updates on Santa's progress, children can also call 1-877-Hi-NORAD to keep posted on what is being seen on the NORAD Santa tracker. The NASA program (National Aeronautics and Space Administration) also keeps track of Santa's activities on Christmas Eve. Special arrangements were made with the North Pole so that NASA could tie into the NPCRS (North Pole Christmas Report System). Santa keeps his NN Report, the Naughty/Nice Report, updated so that he is ready to go on Christmas Eve. By tapping into NASA's Santa Tracker, children and adults watch a map of the world as Santa goes about his business. Get updates and announcements from the North Pole by reading the banner at the bottom of the map. Radio stations and news programs often have a Santa tracking segment. The Christmas Eve tracking report is often given during the weather segment. 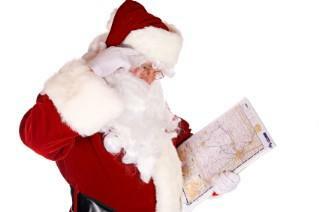 Forecasters will often find Santa and his reindeer on their weather maps and radar. They make sure to give a weather report so Santa knows what to expect when he arrives in each town. The popular search engine Google also has a Santa tracker that operates every December. To keep abreast of the situation at the North Pole, Santa Claus himself often provides updates on a blog or two that he updates regularly. After all, he knows children want to know what's going on with his reindeer, elves, and workshop. Even someone as old as Santa has gotten up with the various technologies to keep everyone updated on his life. Getting Christmas Eve tracking reports makes the entire holiday experience more festive for everyone in the family. Santa Claus cannot leave presents if all the children are awake, so leave out the milk and cookies and put the children to bed so he can make his delivery!